TFMXQRCode is a wrapper around the ZXing QRCode port to Delphi for generating QRCode images. TFMXToast is a control that allows you to pop Android Toast style messages in FireMonkey apps. TFMXSeg7Shape is a component for what appears to be displaying displaying LED style numbers. There is a BaiduMap SDK wrapper for Firemonkey which looks useful for using the BaiduMap SDK in your Delphi apps. TFMXCalendarControl is a custom calendar component in the IOS style for choosing dates on a calendar. TFMXGuesturePassword is a keypad style control that takes gestures to generate a pin number like an unlock code. TFMXSimpleBBCodeText is a simple control which looks like it formst BBCode text (which includes text colors) for display. TFMXImageSlider is an easy to use image slider which can hold a group of images and allow you to slide between them. TFMXCircleScoreIndicator is a circular progress indicator component that contains a number label in the center. TFMXRatingBar is a custom control that allows you to set a star rating (as in a 5 star display). TFMXScrollableList is a scrollable list component that looks similar to have the IOS date time or calendar picker works. TFMXLoadingIndicator looks like a fantastic loading indicator library with a variety of loading animations. graphics32 is a FireMonkey (and I assume cross platform) version of the popular graphics32 library for Delphi. TFMXCallout is an upgraded version of TCallout that uses the INativeCanvas to draw with smooth lines. INativeCanvas is a custom helper class for TCanvas which gives you smooth lines across platforms. TFMXRotatingText is a rotating text component similar to a the rolls on a slot machine. 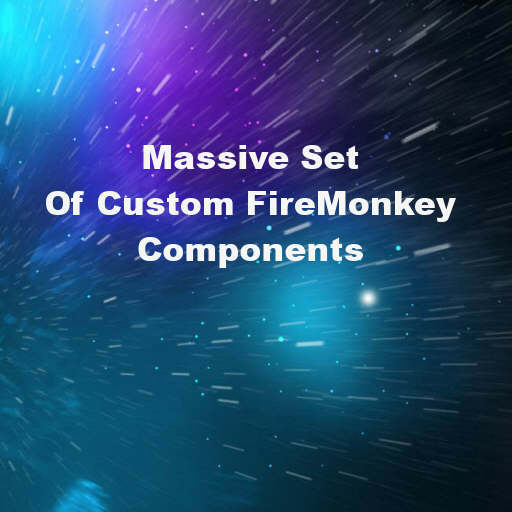 Head over to Github and download the full source code for this awesome free FireMonkey component set for Delphi 10.2 Tokyo. Is it possible to use Graphics32 Library in Firemonkey. Specially for mobile and cross platform developmen? Do you suggest Firemonkey vs C# and other development tools for cross platform development? Why? Where can I find a tutorial ?